San Diego religious leaders Saturday marched to the Otay Mesa detention center and called out to immigrants inside “No estas solo” (“You are not alone”) and heard male and female voices cheer from behind the walls. 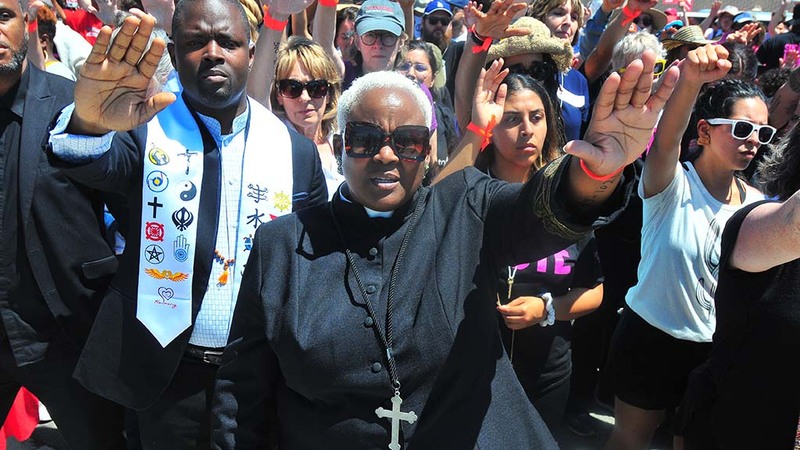 Hours after thousands in downtown San Diego protested Trump administration “zero-tolerance” polices on immigration, hundreds followed priests, rabbis, Buddhist nuns and other clergy to the Otay Mesa Detention center. Bishop Robert McElroy of the San Diego Roman Catholic Diocese said he grieved for the “hurt and wrong” suffered by the detainees treated as rejects. “But even more, we grieve this day for the soul of our nation,” he told the crowd as he stood on the back of a flatbed truck. More than a thousand took part, said a protest organizer with the immigrant rights group PICO California. “Let’s be clear,” said Alvin Herring, director of training for PICO just before the march. “You are here to lodge a protest. You are hear to say to this government that you will not do this to these children…. This is not an exercise. This is not a drill. Several dozen activists wore orange plastic wristbands as a sign they were prepared to be arrested at the privately run jail. A San Diego County Sheriff’s Department spokeswoman said about 5 p.m. that no arrests had made by that agency. But a dozen protesters were blockading a nearby street as late as 8:30 p.m., according to an eyewitness. One of those prepared to be arrested was the Rev. Steve Skiffington, an Episcopal deacon who traveled from a town near Yosemite. Faith leaders — including one who referred to “this wicked government” — said they came to show solidarity with the immigrants inside. Democratic state Sen. Kevin de León, a U.S. Senate candidate, also spoke. A group of 40 “moral witnesses” went past security guards to sing and pray. Told “stop, stop, stop” by guards not to enter the parking lot, the activists went by anyway. He cited the racial and ethnic diversity of the crowd. Buses had transported some protesters from Our Lady of Mt. Carmel Catholic Church, which overlooks Tijuana hillsides. Clergy called for authorities to free the children. A few visitors coming out of the CoreCivic-operated center thanked the protesters for being there. Rabbi David J. Cooper of Kehilla Community Synagogue in Piedmont cited Hebrew scriptures about immigrants. Tenzin Chogkyi of Sacramento, a Buddhist nun originally from Santa Cruz, said at the church afterward that President Trump’s executive order halting family separations didn’t seem to change anything. What was accomplished by the protest? Chogkyi noted the united front of faith leaders and a crowd of all colors and ages. “The more we make our voices heard and make statements like this, the world pays attention,” she said. As many as 5,000 people took part in the Families Belong Together rally, which started around 10 a.m. near the downtown San Diego Civic Center and finished with a march to the San Diego field office of Immigration and Customs Enforcement on Front Street. Wendy Batterson — a leader of San Diego Indivisible, which planned the action — was one of several speakers at the march. A watch commander at the San Diego Police Department said he was unaware of any arrests stemming from the protest. The South Bay rally kicked off a few hours later, at 1 p.m.
Organizers planned to march from a location on Otay Mesa Road to the Otay Mesa Detention Center, where some migrant mothers who had been separated from their children were being held. California Highway Patrol officers and San Diego County sheriff’s deputies were called around 1:05 p.m. to monitor protesters marching in the roadway toward the detention center, according to sheriff’s Lt. Amber Baggs. There were at least two different groups protesting in front of the detention center, including a handful of people who were blocking an exit to the facility, according to media reports. Participating organizations besides faith-based social justice group PICO California included the San Diego Organizing Project. The march comes on the heels of U.S. Sen. Kamala Harris’ visit on Friday to the detention center. It isn’t the first time the federal government has detained migrant children and families, however. In 2014, the Obama administration placed more than 7,000 migrant children in temporary shelters on military bases in California, Texas and Oklahoma for about four months.